A repost, judiciously cut, about those small green vegetables with which children seem to have a love-hate relationship. How about some pure, escapist stories? The world has shut a door for me today, and I feel the need for other worlds. Perhaps I’l just pick a vegetable, any vegetable, and string a few stories along it, both familiar and unfamiliar. Like the story of the impish monkey, who looked longingly down on a great Indian King and his closest, most trusted advisor, thousands of years ago. The King was the ruler of a great city, Benares, a mighty civilisation which towered over the banks of the Ganges. Its streets were full of hustle, and the river was never without a wallowing water buffalo or a holy Brahmin at prayer. Even Kings must get away from it all some time. And the monkey happened upon the great man, as he and his friend stopped to feed their horses during a hunting expedition. The monkey was peckish. He ate well, out here in the wilderness, with everything that nature had to offer him. But those peas the horses were eating – those peas looked good. For these little primates there is only one way to get what you want: ambush. He waited for his moment. And then he hopped adroitly down to the horses’ trough. The two men, watched, fascinated and amused, as those tiny hands scooped up more peas that either would have thought possible. And as they moved in to shoo him away he fled with the tiny gems in his hand, screeching his disapproval of their change in policy. And then it happened: just one small pea dropped from his tiny grasp. To monkeys, possession is an art. And in this elite corner of the world, its practitioners are perfectionists. Consequences are unimportant in the face of possessing something new. So when that pea slipped from the monkey’s grasp, with the little creature’s mindset, there was nothing for it. He spread his palms to catch the errant pea, and all the rest cascaded down out of reach. That wise counsellor who rode with the king laughed so much he could barely breathe. And the he turned to his King, and he said: Don’t make the same mistake, Sire. When you are greedy, remember that monkey. Peas and beans play a part in the folklore of Western countries too.There’s the English boy who chooses to do a deal for beans because some old codger said they were magic. Poor Jack was branded a fool for making a gullible exchange during a chance meeting along the road. But the story’s ending belies its beginning. Jack choose to take a risk, and courted the displeasure of his mother in doing so. He lied, stole and cheated his way to treasures untold, telling himself that big ugly giant was fair game. Finally he murdered the giant. And he and his mother lived happily ever after. Greed, according to this tale, is good. Pulses: a monkey’s jewel; a yokel’s passport to plunder. And also: a way to check a princess’s pedigree.Surely every proper princess will have scrolls and parchments and royal seals a plenty to vouch for her royal forebears. When one Danish Prince Charming came to his time for marriage, he was adamant. He must have a real princess. His mother had ways to make sure this happened. These mothers always do. So when a beautiful princess arrived helpless, soaking wet and alone at the door, claiming to be a real princess, she did not reason why, but put her plan into action. Servants cursed and stewards swore under their breath as the order went out: every mattress in the palace must be brought to the main guest room. A princess was coming to stay. Every door in the palace was jammed by some maidservant or other trying to manhandle a duckdown monolith through the door. And gradually all the mattresses converged on the cavernous four poster bed in the huge guest chamber. One hard, round, dry pea was set on the bed. Then they streamed back in and the mattresses were piled high on top. Of course, the princess could not sleep because she was a delicate princess, and the pea beneath the down rendered her black and blue. The true princess may have had the personality of bilgewater, but the pea rendered her marriageable. And so these unassuming vegetables have become story fodder throughout the world, and I have no doubt there are more pea consommes where these came from. But each people deals with the little green spheres in a different way. The humble pea has sparked thoughts of wisdom, greed and plain vanity. Another reason to eat all your peas. Posted in UncategorizedTagged beans, Jack and The Beanstalk, King of Benares, peas, princess and the peaBookmark the permalink. Whereas the French highly recommend pisse en lit which could be roughly translated as a pee in the bed. 2/5/11 My Jack and Beanstalk post. Jack should be locked up forever. Have you got a link you could leave, Carl ? Love to see that…. Food posts do that to me too, Andra 😀 Wonder if Starbucks do mushy peas at breakfast time…. A crafty telling and a reminder to , well, to mind one’s pee’s and que’s, as my mother used to tell me when I was nosey about things that weren’t my concern. I love peas and they are best tasting to me eaten raw. Indeed, although as a Britisher I confess to adoring mushy peas. With fish and chips. I love the photo of the fresh peas at the top of the post! Beautiful color, so neatly lined up in their pod. Not mine, Patti: the talented photographer’s link is below 🙂 They are lovely, aren’t they? That picture has me planning delicious sweet peas for dinner, if not before. I must have peas! Soon! And thank you for the monkey story. I’d not heard it before, but I could so easily imagine those little monkey paws clutching tiny green pearls. Fresh from the pod… mmm. Even picky Felix devours them like that. And a pea is used to lure a hapless Russian cockerel into a wily fox’s sack in one of his favorite stories. What a veg! A Pea proverb, ‘The partridge loves peas, but not those that go into the pot with it’. Peas reign supreme here. To the extent they have yet to reach the plate. Early spring peas and their shweet goodness is right there if not passing the delights to the pallet of the morel fungi. This year I actual pushed away snow to plant a row of peas. The vines are knee high now; the sweet peas will not be long in coming, a good month or more ahead of the norm for this part of Canada. 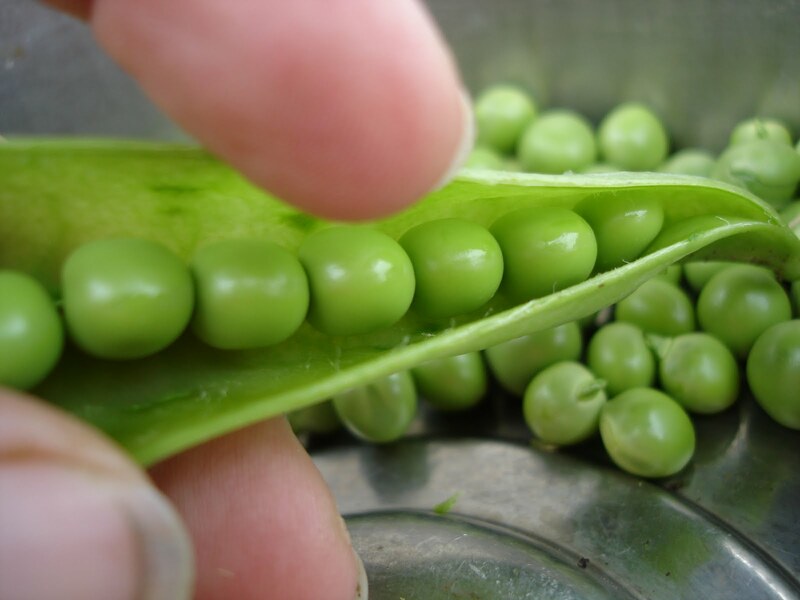 And in keeping with my ability to pull useless bits of info out of my over sized hat, peas it turns out, were used by Gregor Mendel in the mid 1800’s. His observations were the bases to the principles of genetics and heredity. Funny to think, it was peas and not tortoises. whoooopsi, meant palate not pallet.